The late Brazilian installation artist Lucia Nogueira had a taste for things that flew and floated. This show of drawings and watercolours, most of them done in London in the 1990s, features images of balloons, helicopters, ghosts and kites. In one piece neat white teeth hang from a horizontal red stripe against a dark backdrop, looking like clothes on a washing line. In another a helicopter hovers over a column of wispy yellow patches that seem to trace its rise. Elsewhere colourful faces float against the white of the paper, trailing lines of paint below them as released balloons trail lengths of twine. In Nogueira’s world gravity has little pull. She had a light touch. Her drawings, with their gawky lines, thin washes and pared-down imagery, play themselves out in a minor key. They take pleasure in coincidences, in odd conjunctions and non sequiturs, but they often push their whimsy up against something darker. The floating objects are touched with lightness and humour, of course, but also at times with an understated menace. Their weightlessness is not a sign of ethereality but of a randomness that occasionally has dim undercurrents of pain and horror. It is a measure of Nogueira’s wit and judgement that you don’t immediately ask what those heads are doing without bodies, or those teeth without a mouth. Many of the drawings show groupings of similar objects – a trio of televisions, a set of tables, an army of buttons. The items are removed from their context and left in a kind of semiotic limbo. But not all of them are ordinary household objects; Nogueira also had a liking for isolated body parts and prosthetic limbs. In one drawing lone feet protrude from long tubes. In another, Pinocchio’s wooden arms and legs are separated and laid out in rows and, in a clever play on the story, the red of his conical hat seeps out of its triangle, as if the dismantling were really a dismembering. This is one of several images in which runnels and stains of water-colour obliquely mimic the dripping and spreading of blood. Nogueira was alert to the slipperiness of shapes and symbols. She knew how to make a plane look like a sea creature and a rabbit like a snail. In one piece she painted mathematical signs against a dark backdrop, labouring over their outlines as if the meaning of a plus sign were contingent on its painterly treatment – although the signs, which form a horizontal band, could also be read as a luminous fence in a nocturnal landscape. The drawings regularly treat the conventions of picture-making as seductively foreign. The laws of perspective are at times teasingly undermined, as in the drawing of a ladder against a black background. There is no telling whether the ladder tapers towards the top or just looks wider at the bottom because it is pictured from below. And, leading nowhere, it serves no obvious purpose. The viewer is often left wondering what to make of pictorial gestures that look too significant to be entirely accidental but too anomalous to be deliberate. Three garden chairs appear in a row, but their seats are hidden behind large black forms that look faintly like patches of rot but more clearly like the ink blots that they are. A drop of enamel paint interrupts a dark expanse of watercolour, faintly resembling a figure in a landscape, though it could just be a slip of the brush. A large black rectangle which may or may not be a key ring hangs from a chain. These motifs – the ink blots, the drop of enamel, the hanging rectangle – are apparently abstract not by design but by default. The forms in Nogueira’s drawings often look as if they were somehow deflected from their initial and more confidently figurative intentions. The artist was plainly drawn to the gratuitous. The drawings relay senseless pictorial events that are by turns threatening, puzzling and funny. Figures appear where they don’t belong, and once functional objects lie about uselessly or gather in mysterious assemblies. Things lose their weight and substance and hover before the viewer, slipping in and out of legibility. And if the gratuitous, as it surfaces in the drawings, occasionally has undertones of pain, it also provides a deeply pleasurable release from the drudgery of common sense and purpose. Nogueira’s world is shot through with a senselessness that manifests itself in a muffled violence one moment and a throwaway generosity the next – and occasionally in both at once. Before her death at the age of forty-eight, Lucia Nogueira had become one of the most individual voices in sculpture in this country. The artist Liam Gillick once described her as ‘taking things that are close to hand and imbuing them with malignancy and magic.’ Combining and adapting pieces of discarded furniture and other objects, her sculptures engage with the space in which they are set. 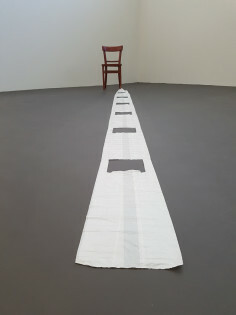 In the work ‘Mischief’ a wooden chair has lost its seat and one leg traps a white bridal train that turns out to be an unrolled strip of plastic carrier bags. ‘No Time for Commas’ has a tied-up bag scurrying endlessly around inside an upturned table top. We don’t know what’s in the bag nor in cupboards turned to the wall, nor why a cable disappears into a plan-chest. In one corner an empty cable wheel is immobilised by a steel pillar. Wit, mischief and enigma also pervade her drawings. Row upon row of buttons become a crowd of spectators. Watercolour blotches take on the character of objects which can’t quite be identified except when one becomes an elephant on wheels. La escultura y los dibujos de la artista brasileña Lucia Nogueira vuelven a las Islas Británicas tras la exposición que organizara The Drawing Room en Londres en 2005. Ahora es Kettle’s Yard, el pequeño centro de la ciudad de Cambridge el que organiza esta pequeña pero deliciosa exposición que lleva por título Mischief y que recorre retrospectivamente una breve carrera que se desarrolló durante unos diez años. Nogueira murió en Londres pero su vínculo con las islas no viene sólo de haber vivido ahí. Como se ha dicho en no pocas ocasiones, como en la reseña de la exposición que en 2007 le dedicó la Fundación Serralves en Oporto, su modo de trabajar el lenguaje escultórico, siendo distinto, guarda ciertas interesantes analogías con cómo se desarrolló la escultura en el Reino Unido (como sabemos, los ingleses fueron los grandes renovadores europeos de las propuestas minimalistas). Mischief es, a su vez, el título de una pieza de 1995 que revela con claridad todo el universo estético de la artista. Se trata de un silla común de la que solo vemos su estructura. Una de las patas delanteras pisa un rollo de bolsas de plástico de la compra. Es una pieza sensacional. La silla, un elemento cotidiano que aquí solo es estructura, esto es, idea. Las bolsas, que habitualmente utilizamos individualmente, forman aquí parte de una estructura mayor. Sabemos de su noción fragmentaria pero no la visibilizamos aquí. Este es el arte de Lucia Nogueira, sutil aunque complejo, enigmático y sugerente. Dice la artista que su arte es eminentemente brasileño. “Es algo que conecta mi infancia con un modo de hacer muy brasileño”. Se trata de una psicología de los objetos que entronca con el lugar de donde proviene. Sostiene que mientras en Europa tenemos la carga histórica del arte de siglos y siglos, en Brasil todo es muy más empírico. De este modo la artista pronto se adhiere a un modo más intuitivo de trabajar y, por tanto, a un tipo de producción más maleable y fresca partiendo de una elección muy singular del material. Es una obra fundamentalmente escultórica que se dirige a aspectos propios e intrínsecos de la disciplina pero también al modo en que se relaciona con nosotros. Hay un guiño minimalista que tiene que ver con el material y con cómo se entiende la escultura en el espacio pero hay otro elemento que lo subvierte, que otorga al material la opción de plantear otras narrativas. La escala de las piezas y la presencia del espectador se convierten en uno de los asuntos centrales en su obra. Y, sobre todo, la naturaleza de los trabajos, con los efectos psicológicos que proyecta, se aleja decididamente del minimalismo en una estrategia compartida por muchos artistas escultores de su generación, especialmente aquellos trabajando en la periferia. Y es que el cuerpo es el mayor implicado en sus trabajos pero es una relación que no es fácil advertir pues genera en todo momento un sistema de tensiones que puede ser tan inquietante como emocionante. La fuente principal de la artista es el objeto encontrado, muebles a menudo fragmentarios que recupera para dotarlos de una nueva dialéctica. A través de levísimas intervenciones es capaz de lograr tremendas transformaciones semánticas. El mero añadido de cualquier elemento trastoca bruscamente la percepción de un espectador que ha de estar constantemente en alerta.